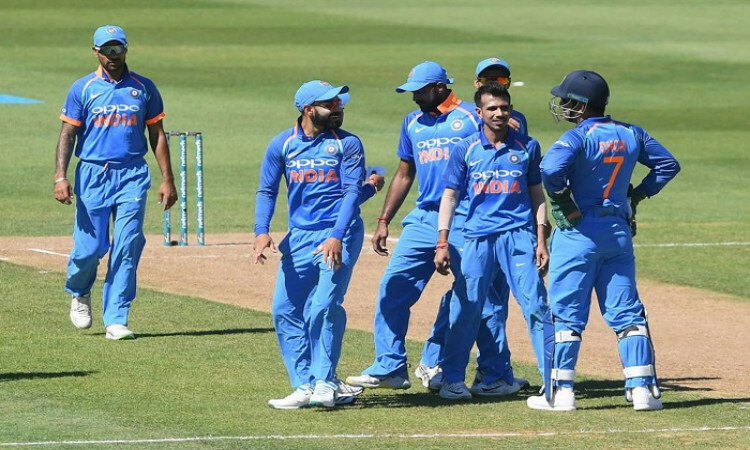 Napier, Jan 23 (CRICKETNMORE): A brilliant all-round effort helped India thrash New Zealand by eight wickets via the Duckworth-Lewis (D/L) method in the first One Day International match at the McLean Park here on Wednesday. Asked to field first, the Indian bowlers were right on the money as they restricted the hosts to a paltry score and then Indian batters displayed a clinical performance to hand India a 1-0 lead in the five match series. Chasing 157, Indian openers Rohit Sharma (11) and Shikhar Dhawan (75 not out) started on a positive note, forging a crucial 41-runs partnership before Rohit was dismissed by Doug Bracewell in the 10th over. He was caught by Martin Guptil in the slips. Just after the fall of Rohit's wicket, sun stopped the play for around 30 minutes. The sun rays were directly getting into the players eyes which prompted the umpires to suspend the proceedings. The break saw the match officials reduce the match by one over and the new target for India was revised to 156 from 49 overs. After the restart, skipper Virat Kohli (45) joined Dhawan in the middle and the duo hammered the New Zealand bowlers all round the park. In the process, Dhawan reached the landmark of 5000 ODI runs and became the second fastest Indian to reach the milestone. It seemed like the Delhi duo will remain unbeaten and complete the match with ease but in the 29th over, Kohli was sent packing by Lockie Ferguson when scoreboard was reading 132. He was caught behind by Tom Latham. New batsman Ambati Rayudu (13 not out) and Dhawan then joined hands and completed the proceeding with 85 balls remaining. For New Zealand, Ferguson and Bracewell took one wicket each. Earlier, India rode chinaman Kuldeep Yadav and pacer Mohammed Shami's exceptional bowling effort to restrict New Zealand to a paltry 157 runs. While Kuldeep's figures were 4/39, Shami was also phenomenal with the leather, scalping three Kiwi wickets conceding just 19 runs from his six overs. Yuzvendra Chahal and Kedar Jadhav picked two and one wicket, respectively. Other than New Zealand skipper Kane Williamson (64), no other batsmen put up a fight against the disciplined Indian attack. Opting to bat, the hosts had the worst possible start as Shami struck early sending back both the openers -- Martin Guptill (5) and Colin Munro (8), cheaply. Newcomers Williamson and Ross Taylor (24) then tried to rescue their side from the early damage, taking New Zealand past the 50-run mark in 13.3 overs. However, Taylor's stay was cut short by Chahal in the 15th over with the hosts at 52/3. With the addition of just 24 runs in the Kiwi scorecard, Chahal struck again to dismiss incoming batsman Tom Latham (11). Jadhav and Shami then joined the party as they sent back Henry Nicholls (12) and Mitchell Santner (14), leaving the hosts reeling at 133/6. Williamson, however, continued to show resistance and kept one end safe, but lacked support from the other end. While trying to clear the fence in the 34th over off a Kuldeep delivery, the Kiwi skipper misread the ball and offered a simple catch to Vijay Shankar at long-on. Kuldeep then put the final nail in the coffin, picking the tailenders -- Doug Bracewell (7), Lockie Ferguson (0) and Trent Boult (1) in quick succession to wrap up the host in just 38 overs.